Humane Education is an important part of any child’s learning experience. We are pleased to bring our unique and interactive Humane Education curriculum to classrooms and schools throughout southern Maine. Communication: Students learn how many ways animals communicate with us and how we can respectfully respond. We explore pet body language and how to better understand their feelings, as well as interact with them in a positive and safe way. Small Animals: Students learn how to properly care for and handle our littlest animal friends such as rabbits, Guinea pigs, rats, chinchillas, and more. Spay/Neuter: When we bring up spay/neuter to children, they always seem to ask “But why would we stop animals from having babies? We love kittens and puppies!” In this lesson, we explore why these surgical procedures are so critical to animal welfare, using math and storytelling. We include an interactive demonstration on how to use “TNR” (Trap, Neuter, Release) equipment. What Goes on at AWS Every Day? Most know that the AWS staff and volunteers find homes for animals. But how does that happen? What takes place at the shelter every day? How are hundreds of animals cared for at once? What else happens at AWS to support the community and its pets? This lesson explores some of the many jobs, functions, and tasks that need to happen day to day so that the AWS can carry out its mission. How do be an Advocate for Animals: What can you do to help animals in need? In this lesson, students will learn the innovative ways they can help animals close to their homes, in their communities and around the world. Interested in another topic? Please ask! To schedule a presentation, contact Humane Educator Brie Roche at (207) 985-3244 ext. 109 or via email. This heartwarming program brings together high school students on the autism spectrum and dogs for in-classroom workshops on canine training. While navigating through an agility course, Jumping for Joy students interact socially, grow communication skills, and improve problem solving, all while building confidence and self-esteem. If you are a special education teacher and would like to learn more about bringing Jumping for Joy to your classroom, please contact Brie Roche, Humane Educator at (207) 985-3244 ext. 109. 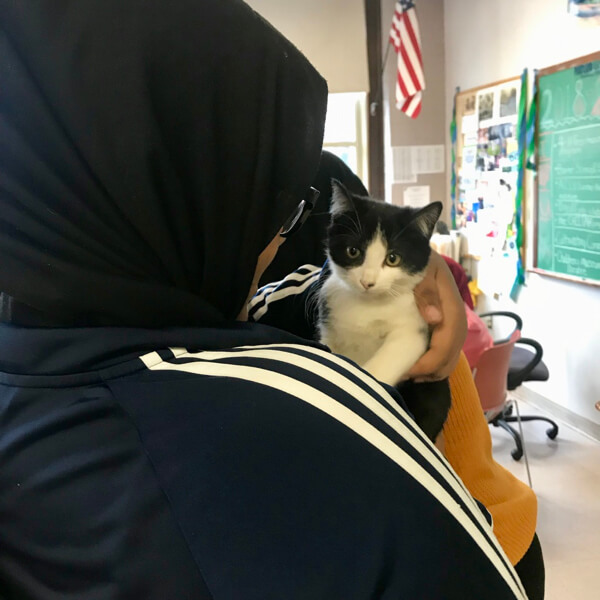 AWS’ newest education program, Animals Unite Us seeks to bridge the cultural gap around having pets for immigrant and English language learning students in area schools. The in-classroom program consists of regular (weekly) hour-long workshops where students learn the basics of pet care for companion animals common in the United States. Each workshop features a different animal, commonly kept as pets in homes and commonly found in US animal shelters. Students learn hands-on about the specific care needs of that animal, their body language, and how to advocate for them. Each Animals Unite Us workshop ends with a written reflection portion for students to consider “Woof is the same in all languages” and “Meow sounds the same everywhere.” Students have the opportunity to write about how the workshop has cultivated their cultural, emotional and physical understanding of the particular pet they have met and to pose questions for further contemplation. This program is run in conjunction with area ELL teachers. If you are interested in integrating Animals Unite Us into your school’s ELL curriculum, please contact Humane Educator Brie Roche at (207) 985-3244 ext. 109 or via email.